Optimal use of EBP involves carefully balancing: clinical expertise, the best evidence available, and patient values + circumstances. 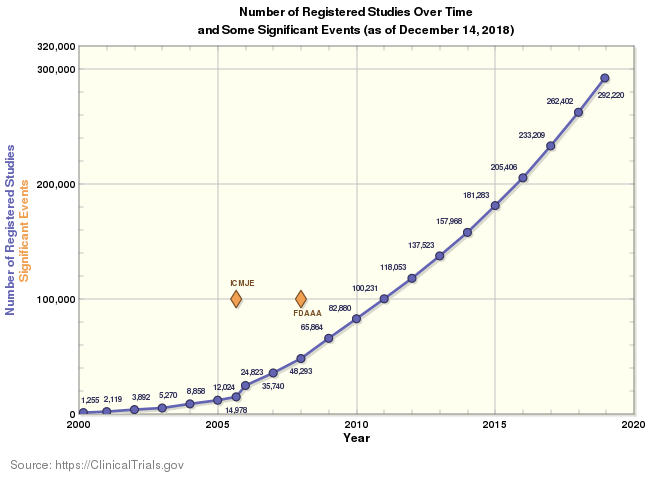 In just 18 years' time, the number of studies available in the NIH database of clinical trials has increased by more than 23,000%. And that is only studies in Clinicaltrials.gov. Think for a moment about all of the other databases where you can find health-based information. In fact, try searching "cancer diagnosis" using Google...how many results does that deliver? On the day this was written (12/14/2018), that search query returned 842,000,000 search results! How do you think information seekers pick from all of those links? According to a recent survey from dotHealth, 31% will opt for the very first result. Why do you think that is? There is an enormous amount of information out there, and it isn't going to get smaller anytime soon. Please keep in mind that this is not always a linear process. Instead, learning how to get the best information using the most efficient methods takes time and is often iterative. Sometimes, you will know where you want to look for information before you know what type of keywords to use. In those cases, you'll spend time going back and forth between asking, aligning, and acquiring as you work out your research needs. How do I define my own expertise, and can that change, expand, or even become more narrow? How do I decide what qualifies as the "best" evidence? And how do I find it? How do I ensure that my patients are treated equitably and given agency to make their own informed decisions? What are the standards required to register a study in Clinicaltrials.gov? Why might people opt for the first result of a Google search? This brief introduction from the American Speech-Language-Hearing Association lays out the basic premises of EBP. A significant influence for many EBP scholars, this seminal paper explores the definitions, goals, and difficulties associated with EBP. Abstract: Clinicians are encouraged to practice evidence-based medicine (EBM) as well as patient-centered medicine. At times, these paradigms seem to be mutually exclusive and difficult to reconcile. It can become even more challenging when trying to include the preferences of the patient’s family members. This paper discusses the basis for this quandary, providing examples of the real-world impact it has on diagnosis-seeking and treatment decision-making behaviors and how it might inform implementation of EBM practices. helps decision makers identify the best available evidence by providing guides to the systematic consideration of the validity, importance, and applicability of claims about the assessment of health problems and the outcomes of health care. Before you start, try following along with the Guide to Forming a PICO Question. Construct a concise clinical question. The first step in EBP is to write a focused clinical question. That question will be translated into a database query in step two. Best practice is to define your research question and identify which types of studies or publications would be best suited to that question before searching the literature. You should also be aware of the patient, if you are seeing one, and how their needs are informing your research. What kind of person is the patient? What is their diagnosis? What is their particular situational need? How would you describe the specific intervention you are considering? What is the desired outcome? Does it involve reduction, relief, or elimination of symptoms? Can it be measured with a test? What time periods should be considered? What study types are most likely to have the information you seek? What clinical domain does your question fall under? Does whole body vibration increase balance in comparison to standard physical therapy in children with cerebral palsy? It can be helpful to classify your question based on the clinical domain it falls under. A clinical domain refers to the type of study you wish to locate. For instance, a question involving therapy (such as whole body vibration) falls under the the clinical domain, therapy. Knowing this, you can filter your search results to return randomized controlled trials, which are the "gold standard" for studies involving therapeutic interventions. Questions addressing the treatment of an illness or disability. In _________ (P), how does _________ (I) compared to _________(C) affect _______(O) within _______ (T)? In _______(P), what is the effect of _______(I) on ______(O) compared with _______(C) within ________ (T)? In African American female adolescents with hepatitis B (P), how does acetaminophen (I) compared to ibuprofen (C) affect liver function (O)? (Time is optional). Questions addressing the act or process of identifying or determining the nature and cause of a disease or injury through evaluation. Are (is) _________ (I) more accurate in diagnosing ________ (P) compared with ______ (C) for _______ (O)? In ________ (P) are/is ________(I) compared with ________(C) more accurate in diagnosing ________(O)? Is a PKU test (I) done on two week old infants (P) more accurate in diagnosis inborn errors in metabolism (O) compared with PKU tests done at 24 hours of age (C)? Time is implied in two weeks and 24 hours old. In middle-aged men with suspected myocardial infarction (P), are serial 12-lead ECGs (I) compared with one initial 12-lead ECG (C) more accurate in diagnosing an acute myocardial infarction (O)? Questions on how to reduce the chance of disease by identifying and modifying risk factors and how to diagnose disease early by screening. For ________ (P) does the use of ______ (I) reduce the future risk of ________ (O) compared with _________ (C)? In OR nurses doing a five minute scrub (P) what are the differences in the presence and types of microbes (O) found on natural polished nails and nail beds (I) and artificial nails (C) at the time of surgery (T)? Questions addressing the prediction of the course of a disease. Does __________ (I) influence ________ (O) in patients who have _______ (P) over ______ (T)? In _______ (P), how does ________ (I) compared to ________ (C) influence _________ (O) over _________ (T)? Does telelmonitoring blood pressure (I) in urban African Americans with hypertension (P) improve blood pressure control (O) within the six months of initiation of the medication (T)? For patients 65 years and older (P), how does the use of an influenza vaccine (I) compared to not received the vaccine (C) influence the risk of developing pneumonia (O) during flu season (T)? Questions addressing how one experiences a phenomenon. How do ________ (P) diagnosed with _______ (I) perceive ______ (O) during _____ (T)? How do pregnant women (P) newly diagnosed with diabetes (I) perceive reporting their blood sugar levels (O) to their healthcare providers during their pregnancy and six weeks postpartum (T)? Questions around how to select treatments to offer our patients that do more good than harm and that are worth the efforts and costs of using them. What is the duration of recovery (O) for patients with total hip replacement (P) who developed a post-operative infection (I) as opposed to those who did not (C) within the first six weeks of recovery (T)? Questions addressing the causes or origin of disease, the factors that produce or predispose toward a certain disease or disorder. Are ____ (P) who have _______ (I) at ___ (Increased/decreased) risk for/of_______ (O) compared with ______ (P) with/without ______ (C) over _____ (T)? Are ______(P) who have ______(I) compared with those without _______(C) at ________ risk for/of _______ (O) over ________(T)? Are kids (P) who have obese adoptive parents (I) at Increased risk for obesity (O) compared with kids (P) without obese adoptive parents (C) during the ages of five and 18 (T)? Are 30- to 50- year old women (P) who have high blood pressure (I) compared with those without high blood pressure (C)at increased risk for an acute myocardial infarction (O) during the first year after hysterectomy (T)? Systematic review: an exhaustive literature search followed by unbiased, expert appraisal of research evidence. Meta-analysis: a systematic review with an additional quantitative component, involving statistical combination of study results to provide a more accurate understanding of the research. Critical review: an extensive literature search followed by theoretical and critical analysis of, not only of findings, but of concepts and systems involved in research. Mapping review: a systematic literature search culminating in a "map" of findings, which categorizes research into groups to be reviewed in further study. Mixed methods review: a systematic review which allows for appraisals of mixed study types, typically quantitative and qualitative. Scoping review: a preliminary review designed to asses the scope of the research available in a particular field of study. It is designed to set parameters for future systematic reviews. These descriptions are derived from Grant & Booth, 2009. Double-blind Randomized Controlled Trials: prospective study that involves collection of data in a clinical setting. Includes double blinding, in which neither the patient-participants nor the researchers know which groups or patients are receiving treatment. Double-blinding is more common in pharmacological studies. Randomized Controlled Trial (RCT): prospective study that involves collection of data in a clinical setting. Includes randomization, in which members in the control and variable groups are selected and placed at random without influence by the research team. RCTs are the premiere study type for researching therapeutic interventions. Randomized Cross-Over Clinical Trial: prospective study that involves collection of data in a clinical setting. Involves the "crossing-over" of participants from one treatment to another after a determined period of time. This type of study is prone to bias, as multiple treatments can overlap. Observational studies typically provide lower levels of evidence than experimental studies, because they do not involve strict manipulation of controls. However, they may offer valuable insight, especially if the application of control factors would lead to undue harm for the patient/s. They may also serve as preliminary studies with the goal of conducting an experimental study later in the future. Cohort study: a prospective study that analyzes data collected from groups designated for observation. These studies are prone to bias because there are limited control factors involved in selection, treatment, or follow-up. Case-control study:a retrospective study that is useful for epidemiological and diagnostic observation. Case-controls measure the similarities and differences between "cohorts" of patients with a common outcome alongside another, similar cohort expressing different outcomes. These types of studies require follow-up and recall, and as such, are prone to biased interpretations and memory. Some study designs are better suited to answer certain types of questions. Identifying the clinical domain your question falls under can help determine what study designs to look for in order to find the best, most suitable evidence. Systematic Reviews and Meta-Analyses are always preferred. Clinical question: In adults with total hip replacements, how effective is pain medication compared to aerobic stretching in controlling post operative pain during the perioperative and recovery time? Before proceeding, open the Step 3: Aqcuire worksheet by clicking here. Foreground information is the complex, precise information often needed in order to answer a PICO question. Before searching for foreground information, however, make sure you have a good understanding of each of the PICO concepts. Sometimes, you will find that you need background information before you ever even begin putting together your PICO question. That's okay! This entire process is iterative, which means repeating steps is sometimes necessary. Put simply, background information is the general health information typically available to the public. That doesn't mean it's easy to follow, but it should be less robust, and more summative than your average peer-reviewed study. Practice guidelines provide one useful source for background information. For the most part, they are short, designed to be understood, and closely reviewed by professionals. 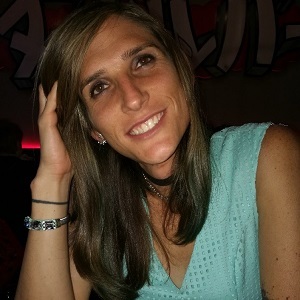 To get an idea what a practice guideline looks like, check out your professional organization's website or look through this sample for working with transgender patients from the World Professional Association for Transgender Health: WPATH Standards of Care. How might you assess whether you need background information or not? What are some important components of good background information? In what situations is having background information especially vital to patient care? For practitioners who need immediate, credible information, appraised resources are highly preferred. BMJ Best Practices and UpToDate are two specific resources that can be leveraged at or around point-of-care. Keep in mind that PubMed also indexes appraised information; however, it is more difficult to parse due to PubMed's scope. This another instance of a Levels of Evidence Pyramid. It's slightly different from the pyramid on Step 3: Align. This on is slightly more advanced, and is designed with growing bodies of research in mind. 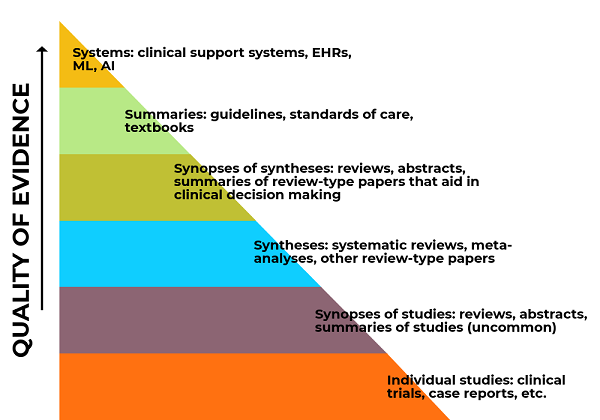 Following from the levels of evidence pyramid (see above), information resources can be collapsed into three broad categories (with corresponding sub-categories): 1) summaries and guidelines; 2) synopses of syntheses and syntheses; 3) synopses of studies and individual studies. When we commit to a research question and literature search, we want to get as near to the top of the pyramid as we possibly can. Depending upon the research available, we work down from there. Why do we want to start at the top, and work our way down? Why do we use a pyramid rather than a square? Why is the top smaller than the bottom? What does it mean if you don't find any research published for your clinical question? Click here to review NAU's complete journal listings. After constructing your PICO question and finding the resource that best suits your needs, it's time to build and conduct a search. Listed below are strategies and tools that will make it easier to find information that is most applicable to you and your patients. Your PICO question should help you identify specific search terms that you can use to search the databases. This, combined with what you learned while searching background information, will help you form the "backbone" of your search question. ex. "cerebral palsy" "children" "pediatrics"
ex. "whole body vibration" "vibration"
More than likely, PubMed is the most common place you'll go for your research. It's an an enormous platform, and houses the MEDLINE, PMC, MeSH, and NCBI Bookshelf databases. It also has its own citation management tool, which you should access before using any other part of the service. This tool can be accessed as soon as you've set up a MyNCBI account. Doing so is fairly simple. Simply click Sign in to NCBI from the top right corner of the PubMed homepage. From there, you need only create a new account. It can be challenging to find exactly what you're looking for when searching databases. For that reason, it's valuable to adhere to the controlled vocabulary in the different databases you search. One of the most well-regarded is MeSH, which stands for "Medical Subject Headings". MeSH terms are an important part of the search experience in PubMed, one of the largest research platforms in the world. MeSH terms are created by the National Library of Medicine. Using them will help you formulate keywords for your search. Follow this link to go to the MeSH database: https://www.ncbi.nlm.nih.gov/mesh. Why is it important to at least browse MeSH terms before conducting a full-on search? Do you think that MeSH terms are valuable in databases outside PubMed? Why or why not? At what point would you want to consider a MeSH search? Now that you've put together your primary search concepts using MeSH, let's conduct a search in PubMed's Clinical Queries tool. The clinical queries tool is designed to provide more efficient access to studies and systematic reviews which correlate with a specific clinical domain. It is not exhaustive! Rather, it is designed to give you more immediate insight into the amount of studies available in your field of study. When you begin formulating a search strategy, aim for a search with high recall rather than precision. In many cases, this will generate a larger number of results than is necessary; however, it is sometimes easier to narrow your search over time instead of doing so from the outset. Avoid using too many search concepts; concepts are the primary terms that align with your search needs. At the same time, a variety of synonymous search terms should be combined in conjunction with each concept. Familiarize yourself with Boolean operators AND, OR & NOT, and apply them within your search string, both between concepts and between search terms. AND separates concepts | "cerebral palsy" AND "whole body vibration" narrows your search, such that you receive papers about both cerebral palsy and vibration. OR separates search terms | "children" OR "pediatrics" broadens your search to include both of these key words. NOT excludes unwanted concepts | "stroke" NOT ("heat stroke" OR "breast stroke") makes it more likely your search results will be limited to cerebrovascular accidents. Parentheses include phrases in your search, but will not limit to exact phrasing. IE: (disorders of sexual development) will return any combination of those keywords. Quotation marks limit search results to exact phrasing. IE: "disorders of sexual development" will return this exact phrase. For more help building these strategies into a search string, check out the University of Arizona search strategy builder. Once you have compiled at least one promising study or review, you should consider a citation management platform like Zotero. This will help you keep your research organized, which is particularly helpful if you're writing a literature review or annotated bibliography! Getting started with Zoteroo is easy (although it does require a NAU login ID). Simply navigate to: https://www.zotero.org and create an account from there. If you need help with Zotero, visit the Library's Research Support Services page, and click on Citation Management Apps. want to explore the "impact" of a specific journal within the discipline. If planning to publish a study, it is very important to identify a journal that focuses on the type of research you want to present. In these instances, authors should also check out a journal's home page, which can be found from the journal listing in PubMed. See this link to view the complete listing for Transgender Health. PubMed Central is the NLM's open-access archive of biomedical literature. PMC indexes published papers, manuscripts, retractions, and other forms of gray literature (conference proceedings, dissertations, etc.). It is an enormous resource, and particularly useful when performing systematic analyses of research, which often require scouring gray literature as well as published studies. When you find studies that you can't access through NAU, that doesn't mean you can't read them! Instead, you'll need to use the library's Document Delivery Services tool to secure the paper from another source. DDS is easy to use once you've set it up. Typically, it only takes 1 - 2 days to receive a requested study, which will be sent as a .PDF for you to save and use later. Aside from PubMed, NAU provides access to a range of health science databases. See the table below (replicated from Step 3a) for specific databases that align with various study types. Use BMJ Best Practices for help finding standards of care, guidelines, and background information. Use CINAHL like PubMed. It's a very large database that focuses on nursing and allied health literature. This is a good source for finding a whole range of review-type papers and individual studies. Cochrane is a premier database for finding systematic reviews. Reviews indexed in Cochrane are typically considered gold-standard because they have to pass Cochrane's rigorous peer-review process. PubMed is more an ecosystem than a database. It is the largest source of primary research you will find. Typically, it is one of the first places you should look for information. Web of Science is a good database to use if you want to search for research using citations. The database allows researchers to go "back and forth" by clicking through citations referenced in different papers. It's very useful for focusing on specific topics. UpToDate is the most well-known place to find point-of-care research. It is easily navigable, and its guidelines go through a peer-review process. Guidelines are updated once every several years. Once you have collected your findings, they must be properly assessed. This page will assist you as you go through that process. AMSTAR (which stands for: assessing the methodological quality of systematic reviews) has become increasingly ubiquitous as the number of systematic reviews and review-type papers has increased. Use this measurement tool when you are assessing any and all review-type papers. Freely available under creative commons, CASP checklists cover: systematic reviews, RCTs, qualitative studies, case controls, diagnostics, and economic evaluations. Checklists are available in PDF and online formats. Cochrane's GRADE Handbook provides very in-depth methods for assessing and synthesizing research. 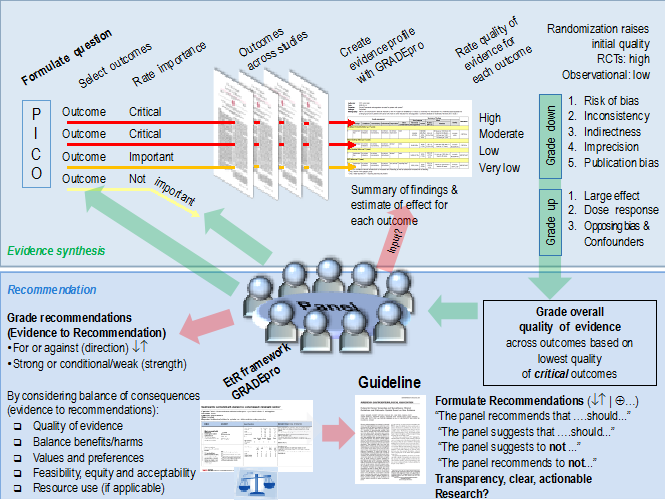 It is primarily used for authors writing systematic reviews and meta-analyses. However, it's scale is one of the most informative and fluid, and can work across study types. The PEDro scale is a well-known grading tool that has been used for analyzing rehabilitative science papers for over two decades. It uses a simple 10 point system, and is particularly valuable when analyzing experimental studies. Before you ever get into a paper, it is possible to obtain some quality assessment data from an abstract. FYI: one easy way to do this is check and see if the paper has been indexed in MEDLINE using PubMed! What was the study design, and is it appropriate for this clinical domain? Did experimental and control groups begin the study with a similar prognosis? Did experimental and control groups retain a similar prognosis after the study started? What are the results? Specifically, how large and precise was the treatment effect? Are results clinically significant in addition to being statistically significant? Were study patients similar to my patient? Are the likely benefits worth the potential harms and costs? Does the intervention impose upon my patient's values and circumstances? Does this resource help me answer a PICO(T) question well enough to analyze and write about it myself? Does this study have wider significance to my field? Can this study be improved upon by further study? A bias is a systematic error, or deviation from the truth, in results or inferences. Biases can operate in either direction: different biases can lead to underestimation or overestimation of the true intervention effect. Biases can vary in magnitude: some are small (and trivial compared with the observed effect) and some are substantial (so that an apparent finding may be entirely due to bias). Even a particular source of bias may vary in direction: bias due to a particular design flaw (e.g. lack of allocation concealment) may lead to underestimation of an effect in one study but overestimation in another study. It is usually impossible to know to what extent biases have affected the results of a particular study, although there is good empirical evidence that particular flaws in the design, conduct and analysis of randomized clinical trials lead to bias. Bias should not be confused with imprecision. Bias refers to systematic error, meaning that multiple replications of the same study would reach the wrong answer on average. Imprecision refers to random error, meaning that multiple replications of the same study will produce different effect estimates because of sampling variation even if they would give the right answer on average. The results of smaller studies are subject to greater sampling variation and hence are less precise. Imprecision is reflected in the confidence interval around the intervention effect estimate from each study and in the weight given to the results of each study in a meta-analysis. More precise results are given more weight. A study may be performed to the highest possible standards yet still have an important risk of bias. For example, in many situations it is impractical or impossible to blind participants or study personnel to intervention group. It is inappropriately judgmental to describe all such studies as of ‘low quality’, but that does not mean they are free of bias resulting from knowledge of intervention status. The GRADE handbook breaks down the official grading rating scaled used for Cochrane reviews. The Handbook itself is lengthy, but it's easy to navigate across sections according to your needs. For appraisal, focus specifically on sections 4 and 5, Summarizing the evidence and Quality of evidence. See the image below for a typical journey using the GRADE approach. Note that it begins with framing the PICO question, and from there, goes through the literature search into appraisal, grading, and recommendations for guidelines. Access the GRADE Handbook available through Cochrane. Learn how to appraise literature in concordance with the clinical domain you've selected. Evidence-based, curated list of publishers and journals known to engage in predatory behavior. NOTE: inclusion in Beall's should not be the primary (or even secondary) criteria for labeling a journal as predatory. Considerations about predatory journal behavior happen through close investigation of articles. Researchers should also cross-check for inclusion in the Directory of Open Access Journals (DOAJ), which takes a similar approach to Beall's by "whitelisting" credible journals. The DOAJ is a peer-reviewed database of open access journals. Aims to improve quality of scientific research through post-publication peer review by the online community. Tracks article retractions and attempts to identify the stories behind them. This essay about the now-famous Broaden trials helps establish the importance of gray literature, the complexities of RCTs, and the need to appraise them critically and fairly. Use BMJ in conjunction with an EBP approach by making full use of the BMJ EBM Toolkit, which includes components for learning EBM, practising EBM, discussing it, and using it.